Welsh-speaking Wales is just recovering from the National Eisteddfod, which is held during the first week of August every year. The eisteddfod (pron. ay-STETH-vod) is a large cultural meeting in which people fly the flag and pit themselves in a vast variety of competitions ranging from dancing, singing, recitation, craft and design and prose. 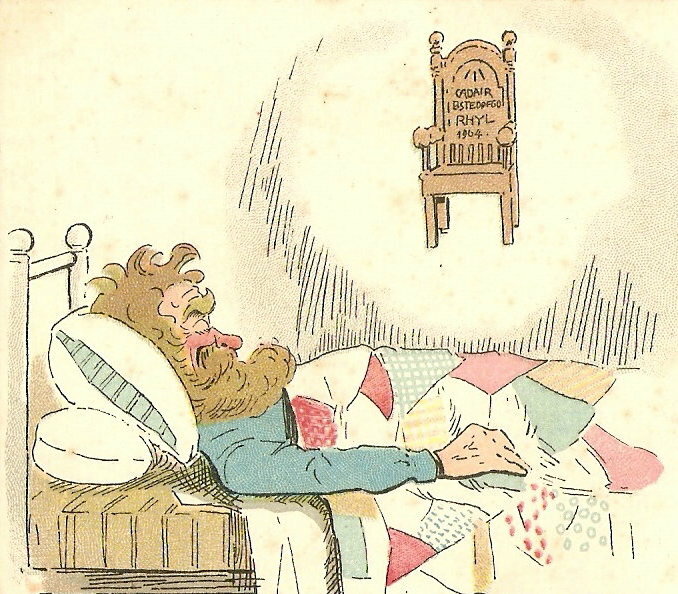 But without doubt, the poetry competitions are the ones that carry the greatest kudos, especially the one in which the winning poet is given an intricately carved chair for the awdl (pron. AOO-dle), a complex ode involving many technical tricks. To say that you’ve won an eisteddfodic chair is probably the greatest feather in any poet’s cap, but to say you’ve won a National Eisteddfod chair is the greatest achievement of all. I’ve mentioned previously a few times that I think the Slate Valley is an area of lost treasures. I would love nothing more than to be able to spend some time there looking for the things that were once a common feature of a vibrant cultural community. In 1895, John Owen Williams, otherwise known as the poet Pedrog, visited Granville and commented after his return in his diary that he considered the folk there as “glewion ein gwlad“, the valiant and brave of our country. High praise indeed and not one given lightly as Pedrog later became a high profile cultural figure in Wales. Pedrog won a National Eisteddfod chair three times – in 1891,1895 and 1900 – before reaching the status of Archdruid in 1928 which he held until his death in 1932. The Archdruid is the ‘main man’ who oversees all ceremonies within the festival! An eisteddfod is also an important social event for Welsh people. It is a time when we can strut our stuff and feel pride in our nation’s abilities – it’s a time that certainly has a great feel-good factor attached to it. The London press often looks upon its activities with a great deal of bemusement, amusement and mockery, but that again mainly stems from its lack of understanding and an unwillingness to tolerate anything “different” to “normal” culture. After witnessing the shameful riots in several English cities last week, they can keep their culture! The highlight of any eisteddfod is the Chairing of the Bard; the colourful, mystical and moving ceremony in which an anonymous poet is beckoned from a packed audience to come up onto the stage to receive his prize. There is always a buzz amongst the audience as to who wins the Chair and the stage is awash with mantled druids, the Gorsedd ( GORR-seth), in their finery awaiting the arrival of the escorted bard once a fanfare of trumpets has called him (or her) to let themselves be known from amidst the anxious crowd. The whole pageantry of the ceremony never fails to generate an armful of goose bumps. The interaction between the Gorsedd’s Prayer and eisteddfod audience is always one that moves. The link above comes close to capturing the ceremony’s mood……..but nothing beats being there and experiencing it yourself! Take a peek at the other four links given by Glyndwr65 that cover some of the ceremony’s highlights if you can’t make it over here! Whenever the Welsh congregate or wherever they settle, song soon follows. The building of chapels begins, but also an eisteddfod will come along before long. The Slate Valley was no different in this. In fact, I have been reliably informed that the first eisteddfod on the American continent was held in Middle Granville in the early 1850’s. I have studied the history of the Slate Valley a lot over the past seventeen years or so and have come across countless examples of these gatherings being held. Most often on New Year’s Day in large halls, chapel vestries and even specially erected tents. They are advertised in newspapers of the period and people travelled from great distances to attend them. Special trains were hired to bring people from all over the north-east of the States and before long, the eisteddfod of Granville especially, had become a large event. One bright local entrepreneur in Poultney even brought out a special cigar called “The Eisteddfod” in order to tap into the possible new source of income. The guesthouses, hotels and taverns of local villages made a roaring trade. 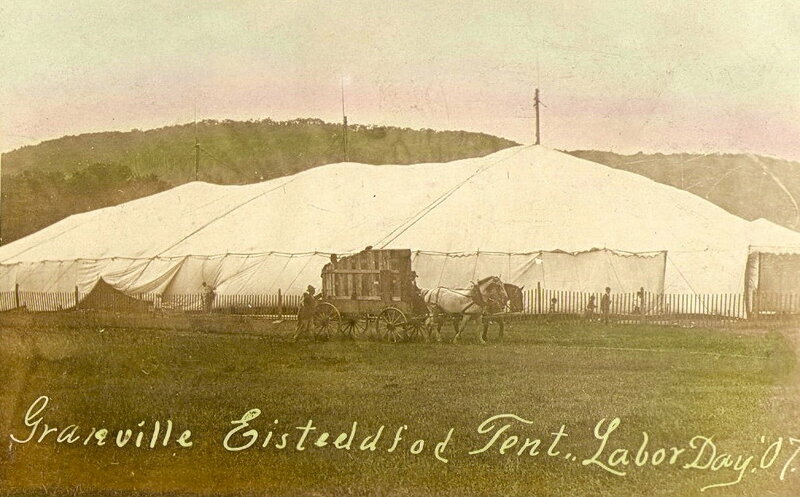 The eisteddfod at Granville of 1907 was a huge occasion with over five thousand people entertained within a big tent. How many people live in Granville today? Prizes of $1,000 were given………a phenomenal amount…. and choirs would employ guest conductors to polish up their skills. 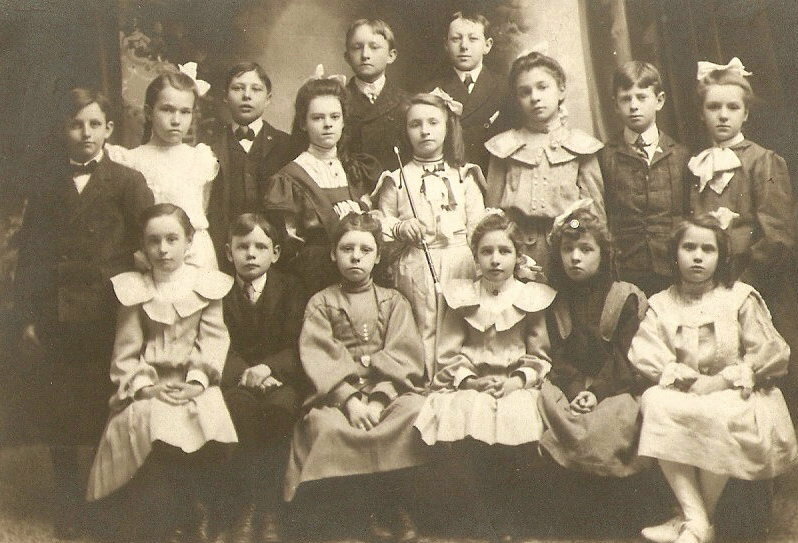 There were even children’s choirs participating such as the one from 1904 in Granville below. Granville, Xmas 1904 - Fannie Jones (the leader) at centre! Rivalries between villages became inevitable and soon the phenomenon called cythraul canu (pron. kuthra-ell KAHnee), literally the devil of singing, the intense competitiveness between opposing sides became very prominent in the area. The periodicals of the time are full of aggrieved competitors stewing over perceived wrongs, but also lines within them often tell of music filling the air where choirs and individuals practised their harmonies. Can any resident of Granville recognise where this site is? Can you work it out from the hills on the horizon? In 1911 though, one hundred years ago, the Slate Valley saw its first Chairing of the Bard at the Poultney Eisteddfod – the victor, John W. Jones, was well-known in the area as Ioan Eryri, John of Snowdonia, a prolific contributor to Welsh-American periodicals. Similar eisteddfodau were held in West Pawlet, Fair Haven, Granville and Middle Granville and I wonder where have all the chairs gone? Are they still in the valley? Are they lying in a room somewhere……..neglected and forgotten? They would have been very desirable and greatly treasured by communities as symbols of their culture……..and as tangible evidence of victories over their rival villages! How many have been thrown away or simply placed in the trash by younger generations that did not comprehend the kudos of having such chairs? Acquiring one would be a great coup for the museum! 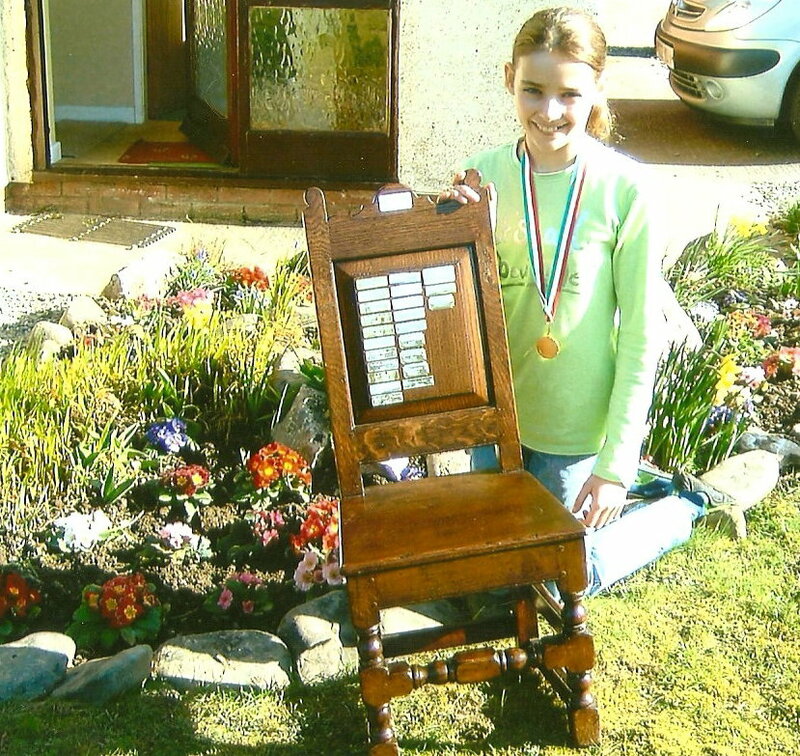 For twelve months, a few years ago, my own daughter won the Chair at her local school before it had to be returned…….but not until after I had taken several photographs of her with it for posterity’s sake! The photo below shows me that my daughter once achieved this great honour, her name is commemorated on a plaque on the chair, but I wonder where the lost chairs of the Slate Valley are now. If there is anyone out there who knows of the existence of one of these chairs it would be a fantastic thing to get into contact with the Slate Valley Museum, which I’m sure would be delighted to house such a treasure. It pains me to think that a once thriving and vibrant community is now silent and locating just one of these chairs would be small step in recovering the voice that reverberated along the Slate Valley. This entry was posted in Uncategorized and tagged Chairing the Bard, eisteddfod, Gorsedd, Pedrog. Bookmark the permalink. Thank you for your blogs. Most entertaining & informative. I am tracing my family in Granville & am able to access the influential Welsh American paper, y Drych, here in Aberystwyth, Wales. The chriniclung of Vermont/Pennsylvania & New York State day to day life is dfascinating to read. Well done! !